At The Dance Hub, we are dedicated to providing ballet technique classes for all, including non-professional and post professional adults, as well as for children and youth. Ballet, when taught carefully, especially with respect to the needs of the adult dancer, is a gateway to a healthy, youthful body and mind, and supports proficiency in other dance forms. The Dance Hub is pleased to offer adult classes that range from the absolute beginner through professional levels. In all ballet classes, we promote the enjoyment of dance, personal expression, and a love for the discipline. Our safe practices ensure the ability to partake in dance throughout one’s entire life. Note: no class on March 26. Ballet for the Adult Absolute Beginner is a 6-class course for women and men of all ages. You will learn to prepare your mind and body to best receive the fundamentals of ballet. Exercises will be clearly explained and demonstrated with a focus on form, alignment, posture, and musical awareness. We will contact you when we have enough students to begin a course. For more information, call us at (805) 450-7535. All experience levels are welcomed in this Saturday morning ballet class. This class is for those taking their first steps in ballet, or students with prior ballet experience wanting to get back into shape. This is a safe space for more experienced ballet students looking to refine their technique or return from an injury, by revisiting the basics. This class is for the adult of any age interested in developing her/his skill level in a nurturing and focused atmosphere. In this well-rounded class, detailed attention is given to each student to facilitate efficient placement, expressiveness, musical awareness and technical proficiency. Some prior ballet experience is recommended. In this class, students will explore and refine the lines, movement and style within the classical form, encouraging each dancer’s musical awareness and individual expression. It is recommended for the adult dancer of any age who has reached at least an intermediate level of proficiency in ballet. We will contact you soon to help you find the class that's right for you and inform you of future classes. For more information, call us at (805) 450-7535. Why should I learn ballet? As we mentioned above, ballet at The Dance Hub is a gateway to a healthy, youthful body and mind as well as proficiency in other dance forms. We further believe that striving to achieve mastery of a discipline such as ballet is a joy and reward in itself, regardless of one’s aspirations to perform. You can enjoy learning and dancing ballet no matter what your body type or experience. How is ballet taught at The Dance Hub? Ballet is taught from the inside out. Rather than trying to emulate shapes, which can put a strain on your body, you’ll learn the fundamentals of placement and posture and the strengthening of core muscles that will prevent injury and help you progress faster. You will feel better in your everyday life, too. I have never danced before. Can I still study ballet? Yes! The dance hub offers a beginner course called Ballet for the Absolute Adult Beginner which will teach you the fundamentals you need to know to be able to benefit from a regular beginner ballet course. Carrie Diamond will do everything she can to assure your success in that course. I have injuries/health issues. Will I still be able to study ballet at The Dance Hub? Providing that you have not been medically advised against strenuous exercise, and you have the desire to work and learn, you should be able to take ballet classes at The Dance Hub. The beginner classes are especially designed to be lower impact to minimize injuries as you build up muscle strength. Carrie Diamond was an avid student in her anatomy classes and has personal experience recovering from injury and working the physical issues of adult dancers! 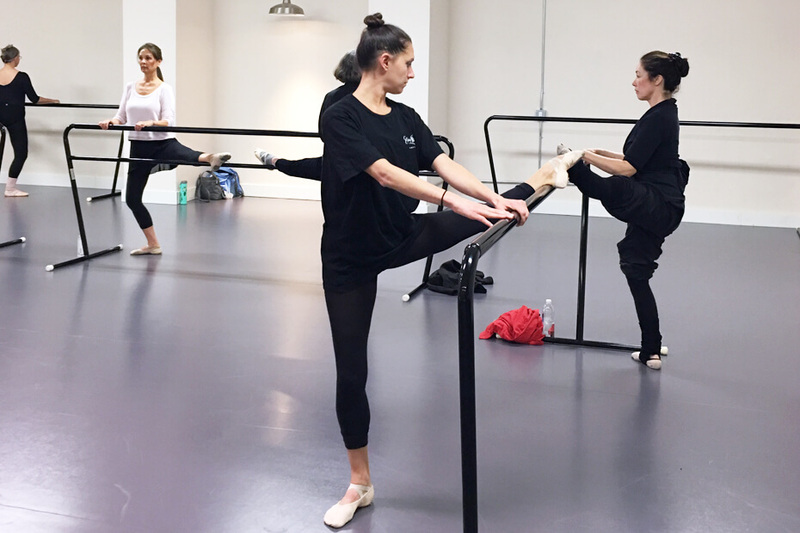 Moreover, The Dance Hub offers additional movement classes that help you maintain an extra healthy body while taking ballet, including Ruth Alpert‘s Foam Roller Restorative class, Stephanie Miracle’s Klein™ Technique, and Ken Gilbert’s Pilates for Dancers. Is there a connection between ballet and yoga? Well, no. But, interestingly Carrie Diamond studied with Margaret Craske, a pupil and disciple of Enrico Cechetti, who went to India to follow Meher Baba. We believe that her spiritual development impacted her method of teaching ballet from the inside out—the technique growing out from the dancers core, both physical and metaphysical, emphasizing feeling, ease, and strength rather than the imitation of unattainable shapes. Carrie found that this approach made her a stronger and more expressive dancer and helped her overcome physical issues and misconceptions about ballet technique caused by imitative learning. What class should I go to? We can help you find the class that’s right for you. Please give us a call at (805) 450-7535 or fill out this form and we will get back to you. Do you offer ballet classes for kids?